We saw the first xtra polybags appear about a year ago as an inexpensive way of obtaining general accessories for (until now) City type builds. I was pleasantly surprised when I opened the door and found a copy of a new xtra bag: 40341 Sea Accessories sitting there. Whether you are building around a contemporary city or historical pirate type of MOC, this polybag has something for everyone. This year, we celebrate the 20th Anniversary of the LEGO Advent Calendar, and the Rambling Brick is taking a trip back and forth through the history of Holiday themed sets, before looking at today’s offering from the LEGO Friends Advent Calendar. In recent years, LEGO City, Friends and LEGO Star Wars have become evergreen Advent Calendar themes. Over the next few days, I would like to take a look at some of the advent calendars that did not have the same level of long term appeal. Today, I will start with the 6299 Pirates Advent Calendar. This was released in 2009 – relatively recently in the scheme of things. 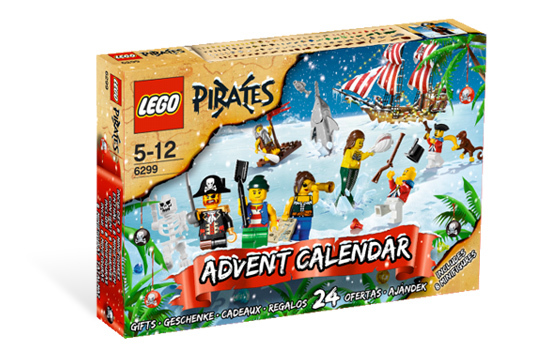 Enjoy 24 days of fun surprises with the 2009 LEGO Pirates Advent Calendar — no looting or pillaging required! With a new buildable character or setting every day, and lots of colorful minifigures, creatures and special elements, you can create your own LEGO Pirates world and play out swashbuckling adventures on the box-lid play mat. Each day open a new window in the specially designed Advent Calendar box! Includes 24 pirate-themed surprises in all, plus a play mat printed on the box lid! Includes 8 minifigures! The set came with eight minifigures and a number of creatures, including a crocodile, saw toothed shark, rat, parrot, crab and monkey. In between, there were a number of minibuilds including a small cannon, some scenery, a treasure chest and raft. Contemporary reviews are quite favourable, but do comment that there is not really any seasonal content included. Captain Brickbeard was opened up on day one, and I suspect if this calendar were to be produced today, he would have had a brightly wrapped present or sack, and a Santa hat! A full list of the minibuilds can be found on Bricklink, as this is from the days before shop.lego.com providing complete spoilers for the advent calendars. This is the only Pirates Advent Calendar that we have seen to this day. Perhaps it would be nice to see another, if Pirates make a return to the mainstream in the future. Follow on after the break, to see today’s build from the 2018 Friends Advent Calendar. I’ve not previously been invested in Ninjago as a theme. Since emerging from my Dark Ages though, I have hopped from City to Lord of the Rings, with a stop off a long the way via Harry Potter and Atlantis, in recent times settling for the relative psychedelia of Friends and Elves (This is not an endorsement of minidoll design, more just a quest for more colour), as well as participating in my other joy: Super Heroes. My MOCs over the last few years are as likely to be Miniland Scale, Micro Scale or even a combination of the two. So: as you can see, not a strong thematic structure to my builds or collection as there may be for other builders. It is, I admit, a bit of a hodge podge. So, when someone said to me this year, “Look at that: Ninja Steampunk Pirate Airship,” how could I refuse? It was an offer too good to refuse.. Pirates, Ninja, Airship, and also Kai’s little Ninja Glider looked extremely swooshable too. Wait a minute. What’s the deal with Kai (I’ve not followed the show at all)? So thats Cyborg Ninja Steampunk Pirate Airship. Mashup complete.